Portillo Visitors Centre with haunting Tenerife entertainment. El Portillo Visitors Centre road sign at km 32,1 also reads Centro de Visitantes above it and can be spotted from far when approaching it with Tenerife Mount Teide on the horizon. You can phone Parque Nacional del Teide Park Offices at: + 34 922 29 01 29 Fax Tel. : + 34 922 24 77 88 for special information. The Portillo is the gateway to the 18900ha of the Cañadas del Teide with their 17 km diameter. The gateway area alone is said to have 4 hectares and is located at 2100 m above the sea. Much typical Teide vegetation grows at that altitude, all of which is drought resistant such as the striking red Tajinaste. But there is much more. Some plants came from the Hotel Parador's endemic garden when that was closed, sometime before Christmas 2011. Of course, this isn't forest country with Pines, Cedars, Laurisilva and the like. No palms are there either. However don't expect too much of a show, as all is still in the making. Best season for the Portillo Visitors Centre? 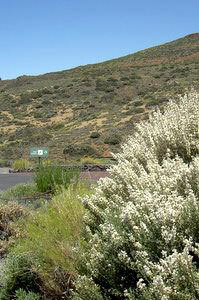 Needless to say, Spring is most spectacular when the white Teide Broom shrubs greet you already by the roadside. Then there is also the yellow Flixweed everywhere. Tajinastes are spread over a remarkable area near the pedestrian path that leads to buildings. They house the reception rooms, film centre and small museum. How reach the centre of the Portillo ? Compare man size with flower size and note the solar panels for electricity generation on top of the roof. Get there from from La Orotava in direction of Granadilla on Mountain Road TF 21. The 2nd option is from La Laguna and the 3rd is from La Granadilla in the South. More possibilities are given by Teide walking and driving suggestions. They include a route via the Mercedes Forest and mention how to get to the Visitors' Centre with a public Titsa bus. Tenerife tours coach bus el Portillo Centre Tenerife. Please mind in this context that the centre of the Portillo which is a halfway house to Teide. But, it's not the same as the Cañada Blanca at el Parador del Teide. 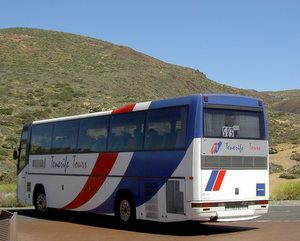 Spot Tenerife Tours written on a luxury coach by the Portillo National Park attraction. General touristic services: all year round except December 25th and January 01. Opening doors: 9a.m. to 3.30.p.m. Why more than stop at the Portillo visitors centre? The centre demonstrates in a most pleasant way by its free film show how Mount Teide Tenerife with its 3717,98 meters came about. It's all done in the context of the Cañadas which form the only subtropical park Europe's. 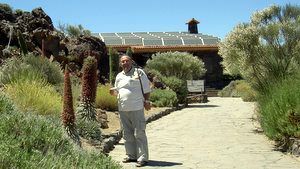 The film accentuates the importance of the World heritage Teide National Park and the whole Canary Island archipelago. You will enjoy a good half an hour of information about the geography,ecology and volcanology of Mount Teide. Your learn how this highest peak of Spain played a role in the evolution of Tenerife. Its relation to the rest of the Macaronesian archipelago and the Midatlantic Drift isn't forgotten. Spot outside washrooms and toilets with disabled access. Four awards were granted to the Portillo Visitors Centre. The most important were of tourist and institutional merit as well as for public relations. Ask for road and walking maps (senderos) at the Portillo de la Villa which is another name for the tourist centre. By the way the zona de reserva is marked red contrary to the light green zona de uso moderado (zone of moderate use) which applies to the other sendero trails except Arenas Negras which is yellow. All this has been established in a big route map by the Tenerife Parks Board in 2011. A bit more photo material is displayed in the corridors of Portillo Visitors Centre. The Spanish people at Visitors Centre reception may never forget me because I complained about a strange about 2 meter walk way kind of indoors bridge made of thick glass with supporting beams underneath shining through. It gave me the sensation of walking over an abyss with nothing under my feet. Earphones make it possible to follow the story on screen at Tenerife el Portillo cinema in different synchronized language versions. Everything shown in the film is based on most probable scientific facts. The 'Spirit of the Mountain' of the movie of Tenerife Visitor Centre is kind of a science fiction character. He keeps you in his ban telling about Teide birth and strange volcanic activities, only 180 000 years ago, of a once estimated 6000 meters high mountainous edifice which transformed Tenerife Island, totally, and left us the much lower Teide. Don't miss the cinema show at el Portillo Visitors Centre! Combine a day trip to El Portillo Visitors Centre with more activities and exceptional lunch! We also saw the only Tenerife trout Tenerife fish farm Piscifactoria Aguamansa (Fish Factory Aguamansa) which is on the right just after turning the next bend on our Canadas ascent at an altitude of 1100 meters at km stone #15. Encounter the farm a few minutes from the trout restaurant Restaurante Aguamansa by la Orotava which is more than a Guachinche country-inn with Canary Island cuisine. Before coming up to Portillo we also visited the large pick-nick spot (zona recreativa) Agua Mansa dedicated to Mr.Ramon Caminero by km 29 mark on the same road F21 mountain road. From from El Portillo Visitors Centre to more Tenerife Attractions.